As a truck driver, a large portion of your time is going to be spent on the open road, going from point A to point B and you are going to have to know where you are going. Being able to navigate is key for a commercial truck driver, and just because you have received your commercial truck loan, does not mean you now know how to navigate. It takes time and practice to learn the basics. Below are four navigation tips to get you started. The difference between navigating a car and navigating a commercial truck is huge. Most of the roads, bridges, overpasses, etc. are built to accommodate the weights and dimensions of cars, pickups, minivans and SUVs. With tractor trailer setups, many overpass clearances are too low, and a lot of municipal roads don’t allow certain hazardous materials to be transported on them. If you don’t do this, you could end up damaging, or completely removing the top of your trailer (and even worse). Just because a map is sold at a truck stop, you should not automatically assume that it is made for truckers. A lot of the business done by truck stops is just general public stopping through on their way somewhere. The first thing you should do after your commercial truck loan comes through is get a good quality road atlas book (such as Rand McNally) for the commercial truck owner and operator. Why do you need a paper map in the 21st century, you ask? Because technology like GPS breaks down and is imperfect. It is always a good idea to hedge your bets, and a road map for truck drivers is essential. Apps can also be wrong, or stop working, and the device that you have them on (your phone, or your tablet) can also break down and throw a major wrench in your day. This isn’t absolutely necessary, but many truck drivers will tell you that it has helped them find an address for the first time. The street view is going to let you know not only where your destination is, but exactly what it looks like, as well as important landmarks in the vicinity. 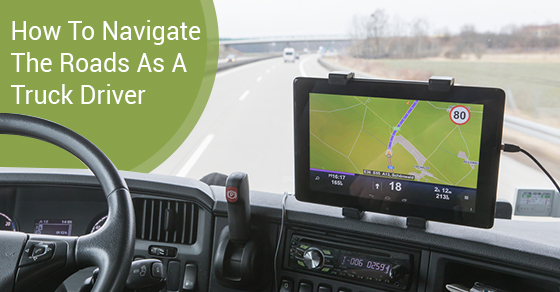 As a commercial truck operator, you need to know how to navigate, period. Your job and your livelihood depends on being able to find your way between buyers and seller. Keep the above navigational tips in mind and ensure that you always know where you are going and minimize the time you spent lost on the road.